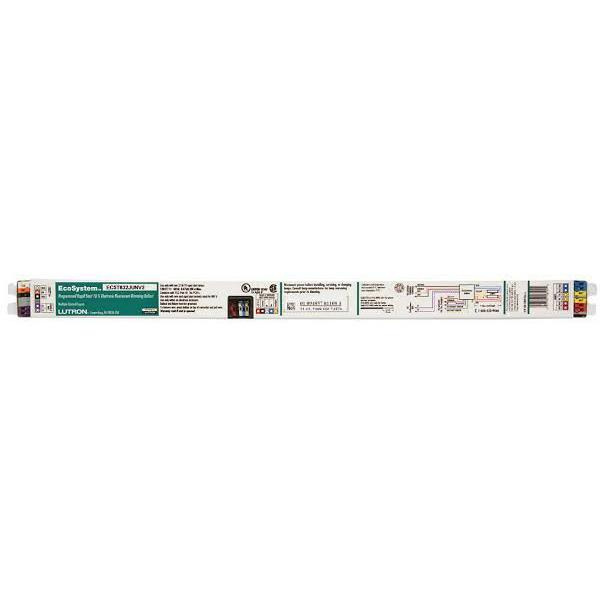 Lutron EcoSystem® High frequency ballast with integral sensor connection, is suitable to use with two 28-Watt 45.2-Inch F28T5 lamps. It has voltage rating of 120/240/277-Volt AC and current rating of 0.23/0.27/0.54-Amp. Programmed rapid start ballast with 1 ballast factor, offers 0.95 power factor. Ballast accommodates solid copper wire of size 16 or 18-AWG. Ballast operates at the frequency rating of 50/60-Hz. It provides Class P protection. Ballast measures 18-Inch x 1.18-Inch x 1-Inch. It provides continuous, flicker-free dimming from 100 - 10%.